GET PAID to GO GREEN! 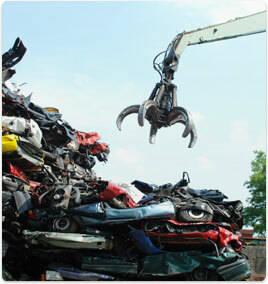 Sell your old banger to an authorized processing facility. Or fill out the form below and get e-mailed a quote. if a lien-holder is also listed, "lien-holder release" area (lower right corner) must be signed off and/or stamped to show lien has been satisfied. 6) State of California Salvage Certificate issued by the DMV to an insurance company when a vehicle is deemed a "total loss"
7) State of California Non-Repairable Vehicle Certificate issued by the DMV to an insurance company when a vehicle is deemed a "total loss" and not permitted to be repaired or re-registered. 8) Abandoned Vehicle Form #462 completed by a badged officer. We pay CASH and provide you with a receipt upon pick up. We offer appointment times at your convenience, with most vehicles removed within 24 hours. Towing can be arranged by our customer service reps for added convienience. We are a fully licensed and insured Recycler. We handle ALL DMV paperwork & documentation.